As the Diplomat has noted recently, the Asia-Pacific has become an important market for modern military aircraft. Companies from countries such as France, Sweden, Russia, and China have been attempting to sell their platforms to a range of states in the region (see here and here for Beijing’s Asian aircraft bids). Several states, including Indonesia, Malaysia and India, are either planning to or are in the process of acquiring modern fighter jets. U.S. companies have a long and established position in this market. This has partially been for political purposes. During the Cold War, many states bought American kit out of necessity as much as quality, as there were few other acceptable sellers available (the French company Dassault being an important exception). U.S. companies are still among the top suppliers of Asian air forces. Today, however, economic considerations are becoming increasingly important and U.S hardware is often prohibitively expensive. As such, it is possible to identify two broad categories of military combat aircraft: cutting edge, “fifth generation” aircraft, and conventional “fourth generation” platforms. In the second category, U.S. models are facing a more level playing field. Modern Russian jets such as the Sukhoi Su-35, so-called “Eurocanards” represented by the Eurofighter Typhoon, Saab Gripen, and Dassault Rafale, and even the joint Sino-Pakistani JF-17 Thunder, represent tough competition for U.S. fighters. 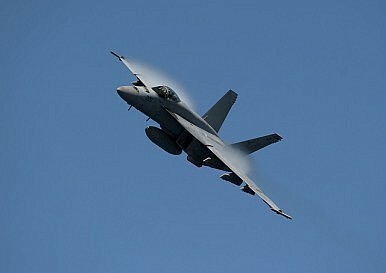 One of the United States’ main contenders for this market is Boeing’s F/A-18E Super Hornet. Originally deployed back in 1999, the Super Hornet is today the mainstay of both the U.S. Navy and the Australian Air Force, with over 500 aircraft fielded in total. Boeing has been aggressively trying to market the Super Hornet to other potential buyers, so far with mixed results. India and Brazil were both approached by Boeing to replace their fleet of fourth-generation fighters–New Delhi ended up buying the French Rafale and Brasilia landed on the Swedish Gripen, partially due to the diplomatic fallout following the Snowden revelations. On the other hand, Finland, Poland, and possibly Kuwait, are considering the Super Hornets for their own fighter replacement programs. All in all, however, Boeing is struggling to find orders for its Super Hornets. Orders for the aircraft have been falling since the last Super Hornet was delivered to Canberra in 2011. Ever since that delivery, new models have been produced mainly as replacements for existing aircraft in the U.S. and Australian arsenals. Furthermore, the Super Hornet, alongside its predecessor, the F/A-18 Hornet, is mainly intended as a stopgap measure until Australia deploys its long-awaited F-35s. Although Canberra has ordered several of the Super Hornet’s electronic warfare derivatives, the EA-18G Growler, for 2017, this will not be a viable solution in the long term. In the Pacific, there are two possible states which represent potential markets for the Super Hornet. Malaysia is in the middle of finding replacements for its 10 Soviet-era MiG-29s. As the F-35 is beyond Kuala Lumpur’s price range, the contenders are the usual suspects: the Dassault Rafale, the Eurofighter Typhoon, Saab’s Gripen C/D and, finally, Boeing’s F/A-18E Super Hornet. The rumor is that the Gripen is leading the competition. This is both due to price, but not least due to the fact that both Brazil and neighboring Thailand acquired the Swedish platform. According to AviationWeek, the timing of this program is not ideal for Boeing. No decision on Malaysia’s future aircraft is likely within a year, but Boeing’s Super Hornet program manager, Dan Gillan, has previously said that the company would have to decide whether to support continued production of the Super Hornet soon. In other words, to remain a candidate for Malaysia, the Super Hornet will need further orders from elsewhere. However, Boeing is still putting up a fight. Howard Berry, vice president for Super Hornet sales, emphasizes the payload-range capability of the Super Hornet, which has twice the empty weight of the Gripen C/D. It also has the advantage that the Royal Malaysian Air Force currently operates the F/A-18D Hornet, of which the Super Hornet is an enlarged derivative. The other contender is Canada. Justin Trudeau’s Liberal government has stated that it will cancel its participation in Lockheed-Martin’s F-35 project and has turned to other sources for its new fighter fleet. As Canada currently operates the Hornet (under the domestic denomination CF-18), Boeing is hoping that Ottawa the familiarity of pilots with the jet, interoperability with the older fleet, and military ties between the U.S. and Canada will make it an obvious choice. Boeing still makes great fighters. Both the Hornet and the Super Hornet are tried and tested platforms, and have given good operational service. However, with rival Lockheed-Martin claiming a huge stake in the international warplane market with its F-35, and foreign companies offering comparable aircraft to the Super Hornet, Boeing will have to fight hard to stay competitive.